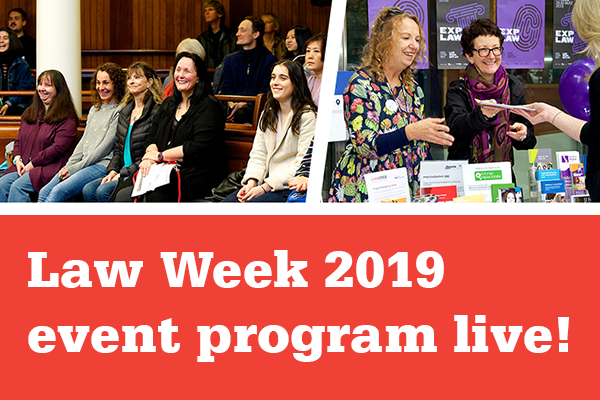 We are thrilled to announce the Law Week 2019 event program is now available. There are over 200 events across the state to inform and entertain you. With performances, behind the scenes tours, information sessions and plenty of children’s activities, Law Week makes learning about the law easy for all Victorians. Uncover our rich legal history, enjoy a theatrical performance, view a film screening or simply enjoy a sausage sizzle. Go behind the scenes at the courts or take part in debates, tours, mock-court trials, legal health checks and music performances. On Saturday 18 May, enjoy a wonderful day out with the whole family at Courts Open Day. On Sunday 19 May, experience the stunning architecture of the building where our laws are made at Parliament Open Day. Stop by our Law Week Hub at Fed Square to find out what’s on and pick up a Law Week program. The full event program is now available online! Use the filters to check specific days or type of event to find the events you want to attend with ease.